The sun is shining bright through the window and fills me with the rapture to wake up from the passive mode of my blog. I am enjoying some sunshine and a long waited vacation time. Meantime I have the recipe for a green smoothie I tried. I know the word 'Green Smoothie' is not well received by everyone. The raised eyes brows, the disgusted look and unpleasant face are some of the common gestures people make when they hear the word 'Green Smoothie'. But I think if we take baby steps in making green smoothies, it will be lot better than hopping all the way to the 'All Green Smoothie'. This recipe includes only one green leafy vegetable. Trust me, there is no leafy after taste because of the apple, grapes and honey added to this smoothie. 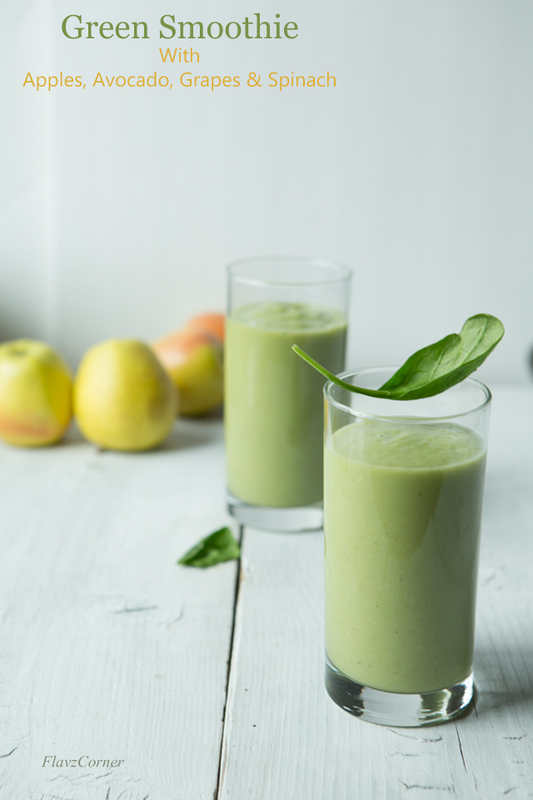 The nutrient rich Avocado and Spinach makes this smoothie a healthy and filling option for those who try to skip meal to lose the extra adipose. Besides the ingredients in this smoothie helps to rejuvenate your skin, boosts up your immune system and provides hair health benefits. Blend all the ingredients together in a blender and enjoy them immediately. You can increase the amount of water per desired consistency. If using Green Granny Smith apples, you may have to adjust the amount of honey. I used yellow apples in this recipe. You can add few pieces of ice cubes too while blending the smoothie for a chilled smoothie. I need more smoothie in my life. This must be very delicious. Yes Angie, It is surprisingly delicious!! Thanks again Remya for the consistent support!! Yes, it is really rich and creamy and has lots of goodness which will keep you full. Thanks Anu!! 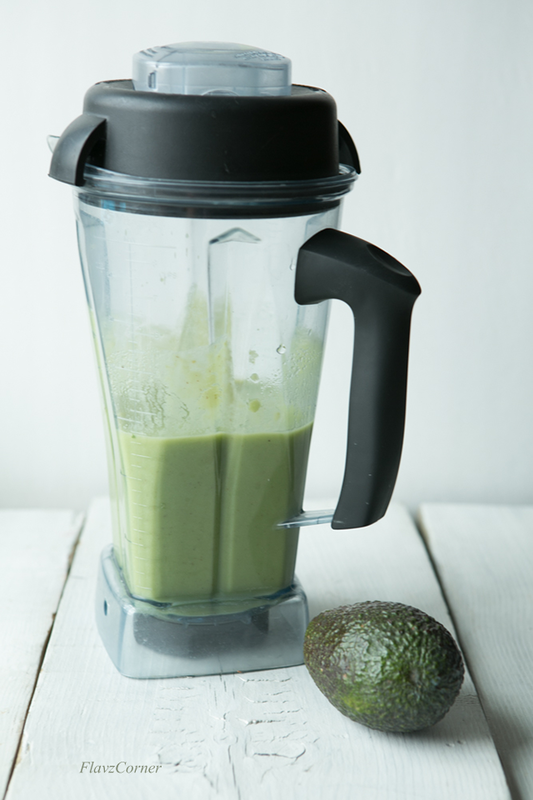 This is a filling smoothie and can be very well used as a breakfast smoothie. I was also skeptical about using spinach in the smoothie and then read a lot about how to slowly add leafy vegetables to your smoothies. So gave a shot with this combination and it worked out very well. I had already made this few times now and I am in love with this smoothie. I so rarely make smoothies -- my loss. Gotta start doing more of them. This looks outstanding -- loads of fun flavors, and so full of goodness. Plus the color is gorgeous! Thanks for this. Thanks John!! Yes, this smoothie is loaded with goodness. Shibi, even looking at the pictures are making me crave for a glass of avocado smoothie! simply stunning! I'm fond of adding spinach in smoothies and this one looks super healthy! thanks for sharing and happy connecting with you too! pinning! Thanks for visiting & commenting Savita!! I was skeptical about adding spinach to smoothie, but I love it now. It was a wise decision to try out spinach in the smoothie. Go ahead and try it and let me know Shweta. Now this is a green smoothie that I definitely can see myself making. I just love everything in it & it looks like the perfect breakfast kind of smoothie too. I love it too and I am making this smoothie more often now. Thanks Thalia!! Thanks Tina for visiting my blog!! Please let me know how you like it. Looks good Shibi. I just recently tried a green smoothie with kale and spinach. An apple made it really good. I think we need more of this ion our lives. Lovely pictures too! Thanks Tisa for your lovely comment!! Yes Tisa, fruits definitely makes the green smoothies better. They overpower the leafy taste, which is helps those you don't like it. Great favor combo. Sweetness of apple with creamy avocado. nice!! Thanks Kankana!! The sweetness from grapes and apple makes this smoothie very refreshing. Hello Shibi, we like smoothies in our home, we do them almost every day. Green one are the best, and I love that you added avocado. 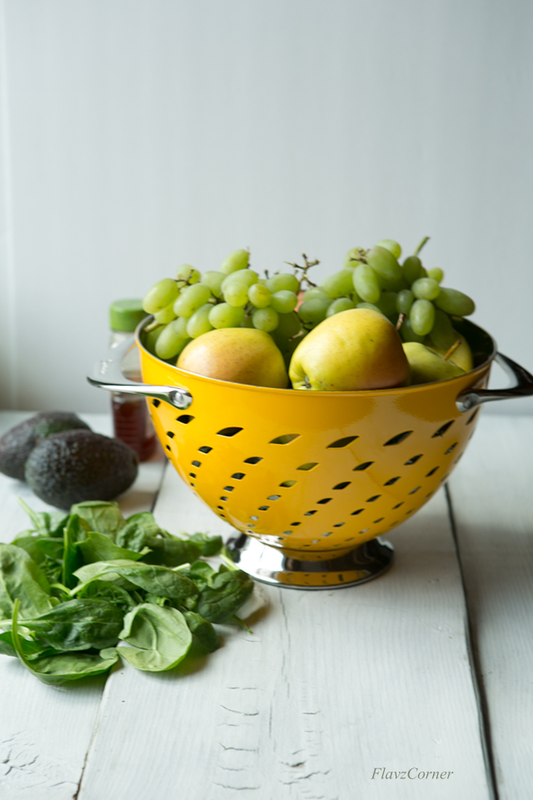 Very nice photos with yellow colander! 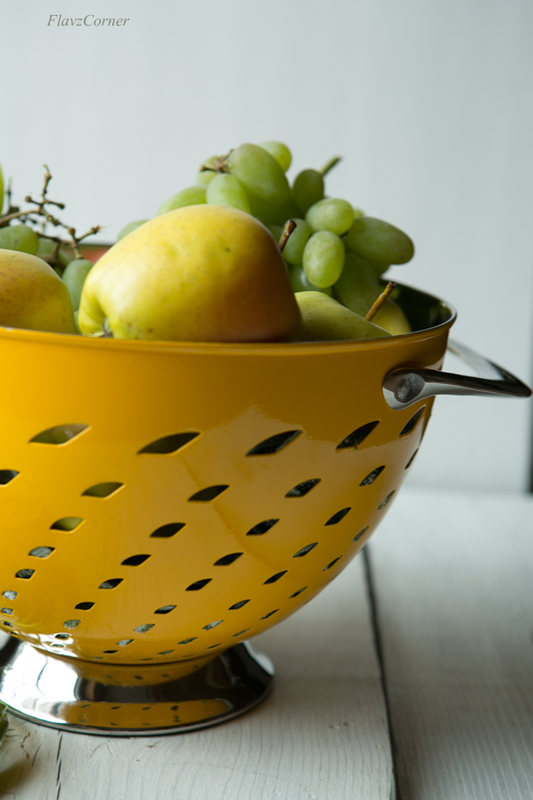 Thanks Yelena for the beautiful Colander!! It took me a while to take it out and start using it, because its so pretty and I simply liked to stare at it rather than using it :). Thanks Taruna!! Please try the smoothie and let me know how you like it. Green drinks are considered to be nutritional powerhouses because Green drink naturally contain many of good elements which are superior and potent sources of high quality nutrients.